Kinda warm New England fall night - but I'm inside. Cubs-Dodgers - game 3 - even as a Reds' fan it's hard not to cheer for the Cubbies. Crowned Heads' 2016 TAA offering is exclusively sold to 'only' 72 US retailers. For those unfamiliar, the TAA is the Tobacconists' Association of America and is comprised of the 80 largest retailers in the US. 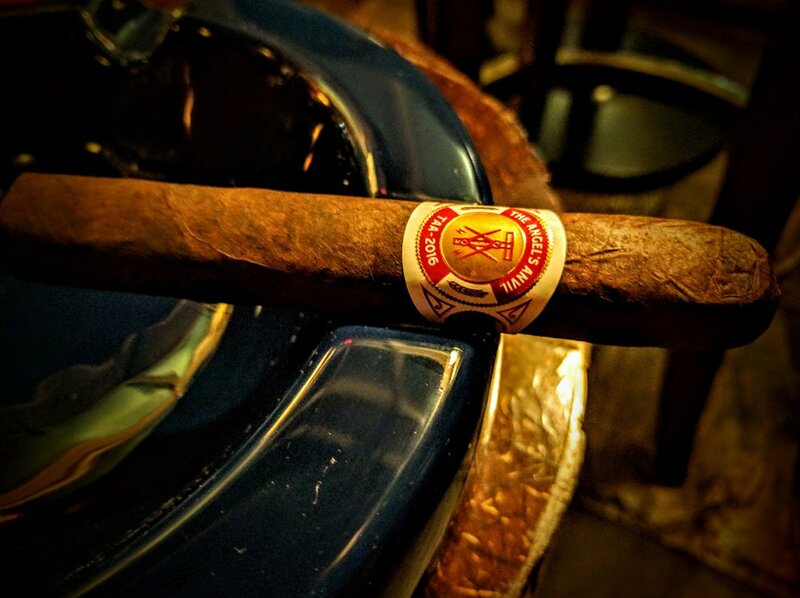 Each year, various cigar producers release certain lines or sizes that are only available to these retailers in limited quantities - which makes them fairly rare and definitely an anticipated difference. 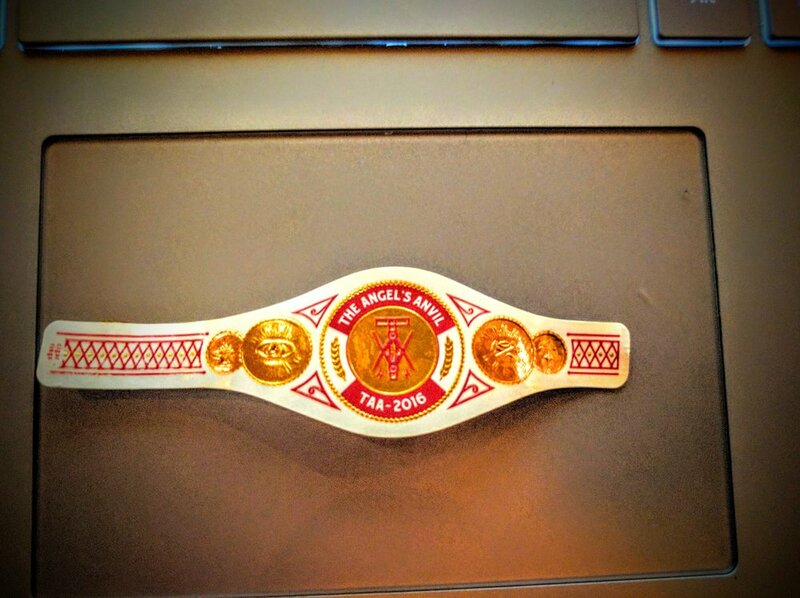 This is the third year Crowned Heads has produced the Angel's Anvil line for the TAA. Nice design but somewhat of a disconnect from the cigar's theme or concept. The band looks more like the US Treasury printed it for Illuminati conspiracy theorists, not the legendary angel who fell to Earth attempting to battle back to heaven. For as much thought as went into the cigar's lore, it feels like the band was an after-thought that was developed the day before release. Absolutely impeccable construction. Firm with almost no give. Careful inspection found no soft spots. Perfectly smooth wrapper, no bumps, no veins. Rounded corners box-press style is really nice and the stick just feels right in the hand - size, shape and weight are all on point. The cap is expertly made and gorgeous. The foot matches, showing off the beautiful pinwheel of the blend. Smells like an old leather couch - in the best possible way. Tobacco, leather, chocolate with small amount of raisin/date. Used my tri-torch to get the cigar going. First puffs are earthy - some deep leathery tones carry over from the cold draw and are complimented with a tame sweet creaminess. 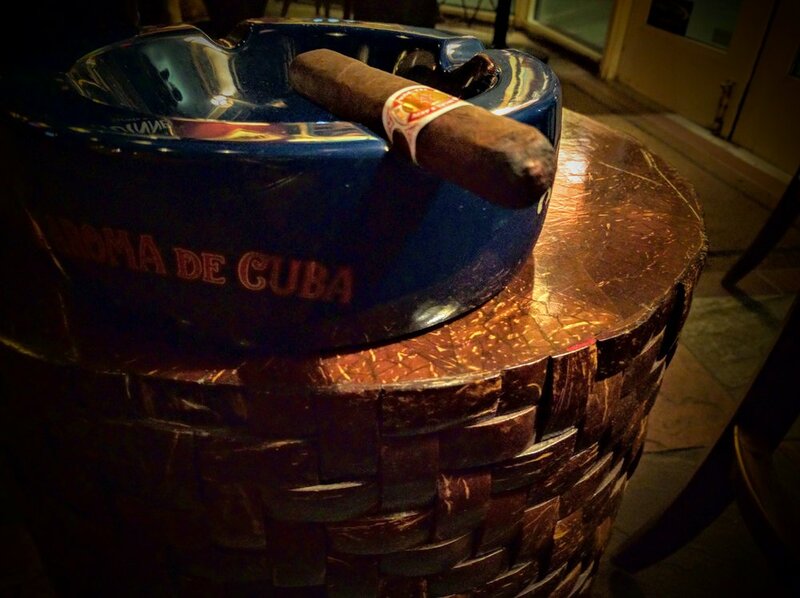 Excellent smoke production - great white plumes with each puff and a timidly productive resting cigar. A steady stream of smoke let's you it's lit. The first third offers some raisin, vanilla and coffee all complimented by a smooth creaminess. The draw in is fantastic and immediately coats the palate with cream - then the subtle other flavors present themselves. Holy crap - did I already smoke half of this?! It's going down waaay too easy - fantastically smooth experience so far. Still very creamy with sweet tones but a little wood and pepper is creeping in. As an aside, this will be the last time I drink a Guinness during a review. The beer's slight bitterness is really messing with my palate and definitely altering the cigar's profile. From here on out, I'm trying to give it a few minutes between tasting and drinking. Towards the latter half of the middle third, getting more vanilla cream. Burn line has been great with very minimal deviations. Still some nutty flavors and woodiness present all backed by a diminishing creaminess. In the final third, the sweet cream seems to be fading into a more toasted nuttiness. At the very tail-end, some vegetables present - maybe like the sweetness of a baked tomato or sun-dried tomato flavor? Some reviewers noted that the smoke time was over three hours! I tend to smoke faster than most but I tapped out around 90 minutes - not sure how others went so long? Really, really good smoke. It went by way too fast and makes me very happy I've got most of a box waiting for me at home! I haven't had the two previous Angel's Anvil releases but it's curious that the blend varies each year, quite dramatically if I understand it right. 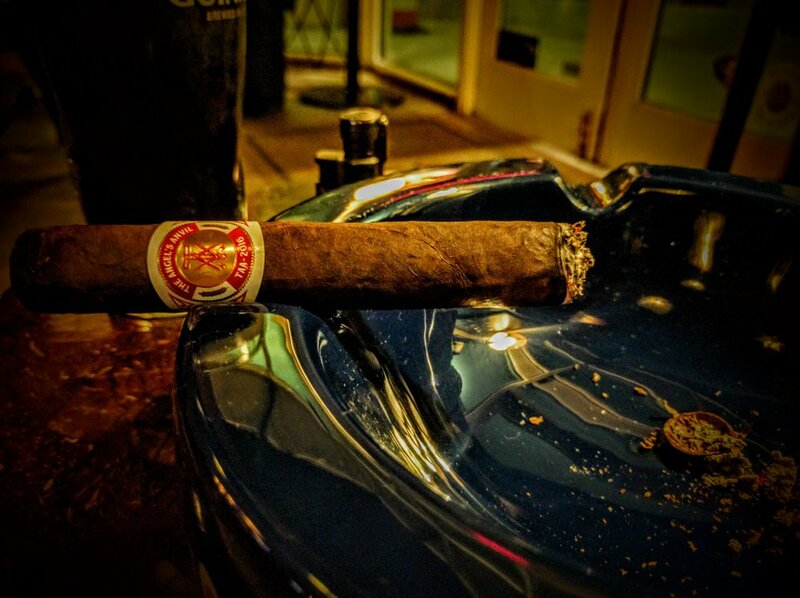 I'll still seek out some of the 2014 and 2015 but it does make it more of an uncertain quest knowing that it will differ from the one I just smoked. A lot of reviewers had burn issues - none were present in my stick - it burned perfectly and I never had to relight.